09/16/2008 - Whether written programs may be kept solely in an electronic format. Title: 09/16/2008 - Whether written programs may be kept solely in an electronic format. Thank you for your April 8, 2008 letter regarding the requirements of various standards for a written program. Your letter specifically asks whether written programs may be kept solely in an electronic format. This letter constitutes OSHA's interpretation only of the requirements discussed and may not be applicable to any question not delineated within your original correspondence. As you pointed out in your letter, a number of standards require programs that are written and accessible to all employees on site. Examples of these provisions are 29 CFR 1910.1030(c)(1)(i) and 1910.1030(c)(1)(iii) (bloodborne pathogens), 29 CFR 1910.1200(e)(1) and 1910.1200(e)(4)(hazard communication), and 29 CFR 1910.146(c)(4) (permit-required confined spaces). Traditionally, these programs have been kept in separate binders in appropriate work areas in order to comply with the standards. Maintaining multiple copies of these manuals can be both challenging and time-consuming. You have also stated that placing safety materials, programs, checklists, and forms on a company intranet can provide significant benefits in consistency, ease of use, and accuracy in maintaining and updating these materials in a timely manner. And, just as hard copy programs can be photocopied upon request, so can an electronic version be printed out upon request. Computers are much more common in the workplace now than when most OSHA standards were written. We agree that in many instances electronic access to programs could be beneficial. Therefore, OSHA would allow a written program to be in either paper or electronic format, as long as the program meets all other requirements of the standard in question. Where the standard requires that the written program must be made available to employees, the employer must ensure that employees know how to access the document and that there are no barriers to employee access. Thank you for your interest in occupational safety and health. We hope you find this information helpful. OSHA requirements are set by statute, standards, and regulations. Our interpretation letters explain these requirements and how they apply to particular circumstances, but they cannot create additional employer obligations. This letter constitutes OSHA's interpretation of OSHA rules. Also, from time to time we update our guidance in response to new information. To keep apprised of such developments, you can consult OSHA's website at http://www.osha.gov. If you have any further questions, please feel free to contact the Office of Health Enforcement at (202) 693-2190 or our Chicago North Area Office at (847) 803-4800. 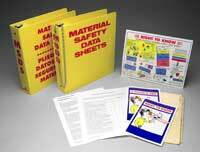 These handy MSDS binder inserts and all sorts of safety binders are available at Safety Emporium. If you prefer electronic means, your MSDS collection can always be up to date with this 400,000+ MSDS database from Safety Emporium. Entry last updated: Tuesday, July 12, 2016. This hypermarked and content-enhanced page is copyright 2001-2019 by ILPI, all rights reserved. Unauthorized duplication or posting on other web sites is expressly prohibited. For questions, comments and concerns, please contact us at our MSDS email address.